OSWEGO, NY – Cayuga Community College Director of the developing Certified Occupational Therapy Assistant program at the Fulton Campus was a recent guest at Oswego Rotary. 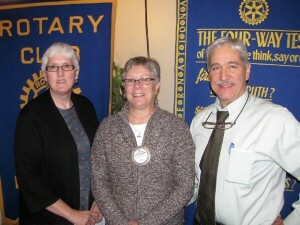 Pictured are: Joan Meyers; Sue Witmer, past club president; and current president Richard Tesoriero. Joan Meyers gave a brief overview of what Occupational Therapy is, what an Occupational Therapist does and what a Certified Occupational Therapy Assistant does. Meyers explained the timeline for development of the program and acceptance of the first class for the fall of 2017. Meyers also shared coursework for the program, prerequisites, licensing and potential employment opportunities.